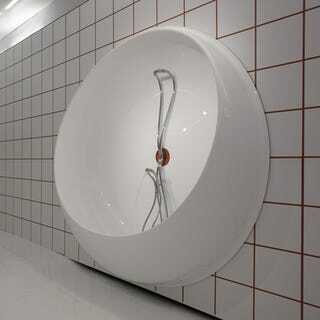 I have a soft spot for Ron Arad. His Bookworm bookshelf was the first piece of designer furniture I craved (admittedly, this might have been due to the fact that it was up on the wall in the apartment of a boy I craved.) He has me confused now, though, with his this design for a bathtub-shower-thingie that ever-so-slightly reminds me of this crazy wall sculpture from last year. Called Rotator, it transforms from shower to bath and back again, but there's something about its continuous trickle of water that makes me want to... hang on, back in a bit.